I’m a poet and children’s author who primarily writes narrative nonfiction picture books. Being a lifelong learner means I love to ask questions and delve into many different subjects that interest me. Discovering little-known stories from history has opened up a fascinating new world. It’s exciting for me to research and bring these important true stories to life for children. There is so much to learn and know! Ann attended another fabulous writing retreat in Georgia in July 2016. She connected with old friends, met new friends, and learned a lot. She met nonfiction picture book authors and illustrators, and picture book agents and editors--YAY! For the eighth year, Ann will be teaching four weeks of Rockin' Arts Camp this summer. She incorporates literary arts (poetry lessons), visual arts (art projects), and performing arts (drama activities). It's so much fun! Ann participated in Maya Gonzalez's THE HEART OF IT e-course last year. 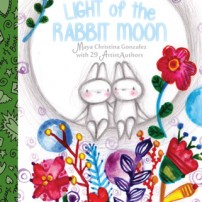 She is proud of her contribution to the upcoming anthology Light of the Rabbit Moon depicting original artwork and a story she created in the class.